Happy blog action day! Last year I highlighted some of my previous posts on climate change, and its frightening how far we’ve regressed since last October. The best segue I can make between climate change and water is the amazing film Sun Come Up . Its (one of) the first to document climate refugees, giving pacific islanders a platform and a voice to share the story of their sinking homes, soon to be swallowed by the oceans. I think that powerful human narratives like these are the most likely to influence our deeply ingrained habits of mind. Riding these waves, I meant to catch On Coal River this week at IFC’s Stranger Than Fiction series this past Tuesday, but I missed it and will have to wait for it to circle back again. In the meantime I’m wondering about seismic cultural shifts – I don’t really believe in sharp historical discontinuities, but some changes look quick in retrospect, even if they don’t feel quick as they are happening. 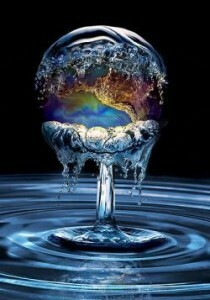 This summer I attended an Evolver spore on the Spirit of Water. Although it covers almost three-quarters of the planet and fills nearly 70% of our own bodies, this precious and seemingly boundless substance is becoming increasingly scarce? Food and Water Watch was tabling, and the movie Flow seems to have made some impact, but the prospect of water shortages and wars is dismal and depressing. Imagine the structures we could construct by focusing and harnessing our collective intension.